The U.S. Department of Agriculture (USDA) has designated 80 counties across five states—California, Idaho, Montana, Oregon and Washington—and 8 municipalities in Puerto Rico as crop disaster areas due to damages and losses caused by drought. Idaho: Adams, Boise, Bonner, Boundary, Clearwater, Custer, Gem, Idaho, Latah, LemhiLewis, Nez Perce and Valley counties. Montana: Lincoln, Missoula and Ravalli counties. Washington: Asotin, Pend Oreille and Whitman counties. Oregon: Benton, Clatsop, Columbia, Coos, Curry, Deschutes, Douglas, Jackson, Josephine, Klamath, Lane, Lincoln, Linn, Polk, Tillamook, Washington and Yamhill counties. California: Del Norte and Siskiyou counties. Washington: Adams, Asotin, Chelan, Clallam, Clark, Columbia, Cowlitz, Douglas, Ferry, Franklin, Garfield, Grant, Grays Harbor, Island, Jefferson, King, Kitsap, Kittitas, Klickitat, Lewis, Lincoln, Mason, Okanogan, Pacific, Pierce, Skagit, Skamania, Snohomish, Spokane, Stevens, Thurston, Wahkiakum, Whatcom, Whitman and Yakima counties. Idaho: Benewah, Latah and Nez Perce counties. Oregon: Hood River, Multnomah and Wallowa counties. Puerto Rico: Aibonito, Arroyo, Cayey, Coamo, Guayama, Patillas, Salinas and Santa Isabel municipalities. Beginning January 7, 2015 USDA has declared crop disasters in at least 1,692 counties, or county equivalents, across 26 States: Arizona, Arkansas, California, Colorado, Florida, Georgia, Idaho, Kansas, Louisiana, Mississippi, Missouri, Montana, Nebraska, Nevada, New Mexico, North Carolina, Oklahoma, Oregon, South Carolina, South Dakota, Texas, Utah, Virginia, West Virginia, Washington and Wyoming. USDA has also designated 8 additional municipalities in Puerto Rico as drought disaster areas. About 99 percent of the 2015 crop disaster designations so far are due to drought. v. The disaster designations posted above were approved by USDA on August 5, 2015 . The official death and damage toll in the aftermath of Super Typhoon HAIYAN continues rising. Super Typhoon HAIYAN (locally known as YOLANDA) made its first landfall in the early morning of 8 November in Guiuan, Eastern Samar province. HAIYAN made subsequent landfalls in Tolosa south of Tacloban City, Leyte province, Daanbantayan and Bantayan Island, Cebu province, Conception, Iloilo province and Busuanga, Palawan province. On November 9, 2013, FIRE-EARTH Models estimated the impact of Super Typhoon HAIYAN in the Philippines as a magnitude 6.2 catastrophe on the FEWW Disaster Scale, indicating large-scale regional destruction with up to 40,000 casualties. FIRE-EARTH Disaster Models estimate the total cost of damage at more than $5billion. In 2004, our team forecast an 80-90 percent increase in the total power dissipated annually by tropical cyclones in the Atlantic and Pacific oceans by 2015. Sunday’s deadly storms killed at least six people and injured scores of others, while damaging and destroying hundreds of homes and businesses and cutting power to tens of thousands of residents. The counties declared disaster areas are Champaign, Grundy, LaSalle, Massac, Tazewell, Washington and Woodford, according to the Disaster Proclamation issued by Gov. Pat Quinn’s office on Monday. A large swarm of storms brought destructive winds and tornadoes to Michigan, Wisconsin, Iowa, Illinois, Missouri, Indiana, Ohio, Kentucky, Tennessee, West Virginia, Pennsylvania and New York. Illinois took the brunt of the ferocious weather system, which spawned a total of 76 confirmed tornadoes, and 451 storm reports. Washington (Population: 16,000), a small city in Tazewell County, about 140 miles southwest of Chicago, was the hardest hit area, with up to 500 homes damaged or destroyed, according to reports. of 16,000. Two of the deadly twisters were rated EF-4 tornadoes, reported the National Weather Service (NWS). EF4 tornadoes pack destructive winds of between 166 and 260 mph (267 – 322kph), and can leave well-constructed houses leveled, blowing away structures with weak foundations blown away some distance; throwing cars and generating large missiles. F4 F touch down in IL November 17, 2013. Tacloban City, Philippines or the State of Illinois? At least a dozen people were killed, more than a dozen others reported missing and hundreds evacuated after storms tore through the Italian island of Sardinia late Monday. Powerful storms and torrential rains submerged roads sweeping cars and destroying several bridges, as rivers burst their banks inundating hundred of home and businesses reported local media. The township of Olbia (Population: 57,000), located northeast of the island, was the hardest hit area. Heavy rains were buffeting both northern and southern Italy with high winds and flooding reported in coastal areas, officials said. Massive floods triggered by extreme rain events hit the island of Sardinia, Italy (Image Credit: AP/Diego Manunta). The city was destroyed by the “apocalyptic” storm, with several dead and several missing. Olbia mayor Gianni Giovanelli told reporters. PHAILIN officially became a Super Cyclonic Storm short time ago, as forecast by FIRE-EARTH, packing sustained winds in excess of 250km per hour. Super Cyclonic Storm PHAILIN. VIS/IR Satellite Image recorded at 01:30UTC on October 11, 2013. Source: CIMSS/SSEC/WISC. FIRE-EARTH Enhancement. On October 10, 2013 FIRE-EARTH forecast that PHAILIN could become a super storm. Super Cyclonic Storm PHAILIN – Projected Path as of 04:30UTC on October 11, 2013. Source: CIMSS/SSEC/WISC. PHAILIN is expected to strengthen further [sustained wind of 270-275km/hr, wind gusts of up to 330km/hr ] and would likely make landfall with super cyclonic force. The potentially deadly storm WILL impact East India’s entire coastline, as well as most of Bangladesh. Indian authorities have issued a cyclone high alert for nine coastal districts of Andhra Pradesh. All 14 coastal districts in Odisha have been put on high alert, five of them – Ganjam, Gajapati, Khurda, Puri, Jagatsinghpur – expected to be worst hit. Andhra Pradesh government has put the navy, army and air force on standby for emergency and relief operations. The 1999 Odisha cyclone was the deadliest tropical cyclone to hit India since 1971. The Category Five super storm made landfall just weeks after a category 4 storm had hit the same region. The deadly cyclone hit India on October 29, 1999 with sustained winds of about 250km/hr, killing an estimated 15,000 people and carving a path of destruction. Chile declared a state of emergency on Thursday after a late frost caused widespread damage to fruit crops in the country’s central region, potentially hitting wine production, reports said. The frost has caused substantial agricultural losses, said Chilean Agricultural Minister in a press release. Exporters have estimated the losses at about US$1billion dollars. “These frosts are the worst that agriculture has faced in 84 years, impacting the area from Coquimbo to Bio Bio,” said the national agricultural society. Temperatures have dipped to as low as minus 8 degrees Celsius below zero (18ºF) since the start of spring in the southern hemisphere, destroying much of the crops in Chile’s central O’Higgins region, a major fruit and wine producing area. Some growers have lost up to a half of their fruit crops including grapes, peaches, nectarines, kiwis, apricots, almonds and avocados as well as vegetables, which will result in hiring far fewer farmhands. “Fruit and wine are some of Chile’s largest industries after copper. Fruit exports were worth $4.3 billion in 2012 and wine exports were valued at $1.8 billion, according to government figures. Agriculture Minister Luis Mayol said 30 percent of the fruit that Chile exports has been affected,” said a report. The frost has damaged up to 61 percent of stone fruit crops, 57 percent of almonds, 48 percent of kiwi crops and 20 percent of table grapes, said the report. However, most crops have not yet reached full flower and the exact extent of damage is not yet known, according to a major exporter. The Chilean government says about 50,000 jobs may have been lost in the wine industry, said a report. The White House has declared a major disaster exists in the Commonwealth of Pennsylvania in the areas affected by severe storms, tornadoes, and flooding during the period of June 26 to July 11, 2013. Most of the losses and damages caused by the severe storms, tornadoes, and flooding have ocurred in the counties of Centre, Clearfield, Clinton, Crawford, Fayette, Huntingdon, Jefferson, Lawrence, Venango, and Wayne. Additional designations may be made at a later date if requested by the commonwealth and warranted by the results of further damage assessments, said FEMA. Typhoon WUTIP is currently a Cat 2B and expected to intensify to a Cat 3B hurricane force, headed directly toward Vietnam. Typhoon WUTIPVisible/Water Vapor Satellite Image, with the projected path superimposed. Image recorded at 05:32UTC on Sunday, September 29, 2013. Source: CIMSS/SSEC/WISC. FIRE-EARTH Enhancement. Typhoon WUTIP. Visible/Shortwave IR Satellite Image recorded at 04:32UTC on Sunday, September 29, 2013. Source: CIMSS/SSEC/WISC. FIRE-EARTH Enhancement. The deputy PM responsible for flood management has assured the public that a scenario like the 2011 devastating floods in which all major dams in Thailand reached full capacity would not happen. Unless, off course, there’s more heavy rain in the north! “He said the major dams in Thailand are now at half of its capacity and can contain more than 10,000 million cubic meters,” said a report. The growing season has ended for White Pine, Southern Lander and Southern Eureka counties, said NWS. Temperatures dipped into the 20s across the majority of Southern Lander/Eureka and White Pine counties on Friday, killing most tender vegetation in these areas. Light freezes have also occurred in other forecast zones including Northern Lander, Northern Eureka, Southeastern Elko and northern Nye counties. Growing season in isolated areas in these counties may have also ended. At least 48 people drowned and more that 100 others are reported missing after a boat sank on the River Niger in central Nigeria late Friday, according to local reports. The boat may have been overloaded, carrying more that two and a half times the number of passengers allowed, reports said. “More than 30 people were still missing two days after a boat carrying asylum seekers to Australia sank off the Indonesian coast, killing 22 people including seven children,” Indonesian security officials said. Death toll reached 60 on Sunday in the collapsed apartment building in India’s financial capital of Mumbai, officials said. Some 33 others were rescued from the building’s wreckage. The five-story building, which collapsed on Friday, was the third deadly cave-in of a Mumbai structure in six months, said a report. Attacks by swarms of giant hornets in Shaanxi province, central China, has left at least 28 people dead and up to a thousand others injured, many of them seriously, according to reports. Terrorized victims have described being chased by large swarms of hornets for hundreds of yards and stung as many as 200 times over several minutes. The insects have a highly toxic sting that can lead to anaphylactic shock and kidney failure, according to experts. It’s believed that the swarms are populated mainly by the Asian giant hornet or Vespa mandarinia, which grows up to 50mm (2 ins.) long with a 6mm sting. Experts have previously suggested that warmer temperatures in the region may be responsible for hornets breeding more successfully. The entire town of Hartenhausen (population: ~ 3,000) near Ludwigshafen in central Germany was evacuated on Saturday after a major gas explosion injured 16 firefighters and shattered windows. The blast was so powerful it could be heard up to 30 kilometers away, AP reported. At least 50 Nigerian students have been killed in an armed attack, AP reported. The attack occurred at an agricultural college in northeast Nigeria’s Yobe State. Gunmen broke into the college dorm at night and shot students as they slept. The authorities have blamed the Boko Haram [“Western education is forbidden”] group. Two bomb explosions in the northwestern Pakistan city of Peshawar killed 36 people and wounded more than 100 on Sunday, authorities said. The victims included 12 members of a family who were shopping at the blast sites, according to local officials. The powerful blasts destroyed about 20 buildings and many vehicles in nearby streets. The Peshawar twin blasts were the third major terrorist in the city over the past 8 days. A twin suicide bomb attack on a Christian church on September 22 killed more than more than 80 people. On Friday September 27, a bomb planted on a bus carrying local government employees exploded killing at least 19 people. At least 30 more people were killed in Iraq Saturday and Sunday, as of posting, in the cities of Arbil, Baghdad, Baiji, Basra, Falluja Mosul, Mussayab, Muqdadiya and Tikrit by bombs, AEDs, IEDs and gunfire, raising the death toll for September to 1,079 so far. Death toll for 2013 has exceeded 6,000 and is expected to climb higher. The quake has killed at least a dozen people and injured more than two dozen others, after it destroyed several houses in Nokjo district of Awaran, Baluchistan, according to early reports. Meantime, death toll from an earlier earthquake that struck the region on September 24 has reached 515, with about 1,000 others injured, according to local officials. The earlier quake, which was followed by several significant aftershocks, destroyed thousands of homes in villages near the epicenter, affecting more than 300,000 people in the sparsely populated region. This earthquake was an aftershock which occurred approximately 30 km to the NNE of the September 24, 2013 M7.7 event, according to USGS/EHP. EQ Location Map. Source: USGS/EHP. Enhanced by FIRE-EARTH Blog. The powerful typhoon has killed at least 25 people in south China’s Guangdong province, authorities said. Previously, officials said the typhoon had also claimed more than a dozen lives in the neighboring Fujian province. USAGI, the 19th and the most powerful typhoon to hit China so far this year, made landfall Sunday night with wind gusting up to 180 km/h. The powerful typhoon has affected more than 3.56 million people in Guangdong province alone, forcing at least 226,000 people out of their homes, Xinhua said. On Sunday, thousands of flights in Guangdong, Guangxi, Fujian, Hong Kong and Macao were canceled or delayed, and shipping between Fujian and Taiwan was suspended. Hong Kong was hit by severe winds and torrential rain, forcing schools and businesses to close, but the territory escaped a direct hit by the typhoon. Tropical Storm MANUEL, which has battered southwestern Mexico, has now intensified into a category one hurricane approaching northwestern Mexico and threatening more destruction. MANUEL and INGRID, the first twin storms to hit Mexico within one day since 1958, have killed at least 80 people across Mexico. About 60 people are now reported missing after a landslide buried a village in the southwestern Mexico. The Mexican President Nieto said at least 58 people were missing after a massive landslide buried the village of La Pintada in the southwestern Guerrero state. MANUEL is expected to dump up to 15 inches of rain in the state of Sinaloa, which could cause deadly flash-floods, according to forecasters. Heavy flooding reported in the State of Oaxaca in SW Mexico as Storm MANUEL and Hurricane INGRID pounded the region, killing at least two dozen people and prompting authorities to issue multiple warnings and urging residents to prepare for flash floods and mudslides. Torrential rains have destroyed highways and bridges in Veracruz state, as INGRID moved closer to making landfall, and MANUEL was Less than 80 miles off shore. INGRID was located about 80 miles northeast of Tampico, Mexico, as of posting, with maximum sustained winds of 120 km/h, said the National Hurricane Center. Dozens of rivers including Slaves, Motagua, Chixoy, The Passion, St. Peter and Usumacinta have flooded causing widespread deluge as forecaster warn of more torrential rains to follow, said the National Coordinator for Disaster Reduction (CONRED). The authorities have issued an “orange alert” for destructive flooding in several regions. Source: Guatemala’s National Coordinator for Disaster Reduction (CONRED). “In the last 48 hours in Jalapa department, some 783,000 people were affected and dozens of homes damaged,” according to a translation of bulletin issued by CONRED. In the week to September 12, 2013, CONRED said it had responded to 39 incidents of landslides; 38 incidents caused by an earthquake on Friday September 06; 14 flood-related incidents, 4 slides, and one incident of collapse that affected more than 200,000 people nationwide. Federal Disaster area declared for Fort Collins, northern Colo.
Thousands more evacuations have been ordered for the northern neighborhoods of Fort Collins. The Poudre River is flowing at a rate of about 10,000 cubic feet per second (cfs), 100 times its normal flow, flooding significantly through Fort Collins and is expected to rise. Officials have urged thousands of people to take shelter in dozens of the northern neighborhoods of Fort Collins. Severe flooding has forced officials to close bridges, schools, and city offices in Fort Collins and Loveland, Colo.
Colorado State Patrol troopers took this photo on I-25 near Highway 34 in Larimer County at 7:30 on Friday, September 13, 2013. The Big Thompson River is flowing at more than 9,000 cfs, the highest level since the Big Thompson flood of 1976, officials said. “The city of Loveland has essentially been divided in two by the flow of the Big Thompson River,” said Tom Hacker, public information officer for the city of Loveland. As of Friday evening, the death toll from the worst floods to hit Colorado in living memory had climbed to at least four with 176 others still unaccounted for. “It’s got to be the largest storm that I can imagine in the state’s history,” said Governor John Hickenlooper at a news conference. Meantime, the White House declared an emergency exists in the State of Colorado and ordered federal aid to supplement state and local response efforts due to the emergency conditions resulting from severe storms, flooding, landslides, and mudslides beginning on September 11, 2013, and continuing. The declaration is in response to the threat of catastrophe in the counties of Boulder, El Paso, and Larimer, said the WH statement. On Friday, Governor Hickenlooper declared a disaster emergency for 14 counties. New Jersey Gov. Christie declared a state of emergency on Thursday as fire crews worked to contain a massive blaze that has ravaged a large section of the boardwalk along the New Jersey Shore, devouring dozens of nearby businesses, according to reports. Hundreds of fire crews have been deployed to tackle the blaze in the Seaside Heights area which became a six-alarm fire in less than two hours, destroying large sections of a landmark that was recently restored following the damage caused by Hurricane Sandy. “I feel like I want to throw up… After all the effort and time and resources that we’ve put in to help the folks of Seaside Park and Seaside Heights rebuild, it’s just unthinkable.” WCBS quoted Christie as saying. The massive blaze began in Kohr’s Frozen Custard near the boardwalk in Seaside Park, and rapidly spread over seven blocks. About 50 businesses were destroyed, said NJ.com. A wildfire in Northern California’s Shasta County has destroyed 80 structures and damaged at least 30, many of them homes, and is threatening another 300 structures near the rural community of Happy Valley, about 150 miles north of Sacramento. 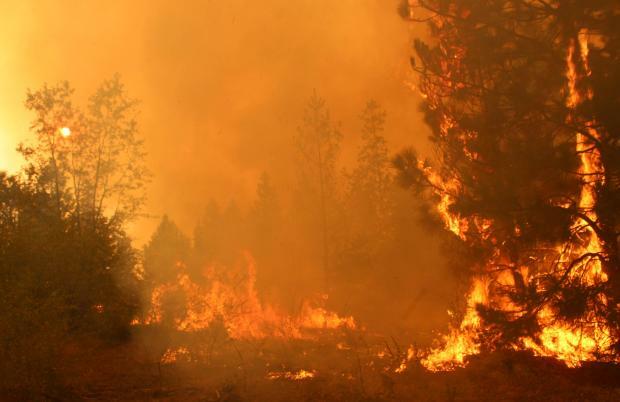 The fast-growing Clover Fire, which began about 13:00 PDT on Monday, had rapidly grown to about 7,400 acres (11.6 square miles) by early morning Tuesday. Mandatory evacuations are in place for hundreds of homes, and many residents have been advised to leave their homes. Some 1,129 fire personnel have been deployed, and the fire was 40% contained as of posting. The cause is under investigation, said Cal Fire. Wildfires destroy homes, injure fire crews and force mass evacuations in west Sydney. At least 59 bush and grassfires are raging across New South Wales (NSW), including 40 uncontained blazes, with more than 500 firefighters and 200 fire engines on the ground, said NSW Premier. The fires have forced the authorities to evacuate scores of homes and a University of Western Sydney (UWS) campus following a power outage that affected the entire Richmond area. Additionally, more than 300 students from St Paul’s Grammar School In Castlereagh were evacuated to Penrith’s Whitewater Park after an emergency warning was issued for a fire threatening properties on nearby Devlin Street, said a report. Intense heat from a wildfire sets a truck on fire near Londonderry Road, West Sydney. Photo credit: Nick Moir/ via the Age. The heat was so intense firefighters were forced to abandon their trucks when they became surrounded by bushfires in Sydney’s western suburbs, said a report. The bushfire season has come early to Sydney area, with out-of-control fires devouring the city’s west, reports said. Mandatory evacuations were ordered for about 75 homes in Morgan Territory Road in unincorporated Contra Costa County on Sunday, September 8, due to a fast moving wildfire. The so-called Morgan Fire rapidly burned out of control, consuming at last 800 acres, and threatening homes and other structures in the area. Environmentalists have accused UK govt of covering up pollution figures as it plans to shut down some 600 stations across England to cut costs, said a report. Federal regulators say there are no safety issues that would preclude a license renewal for Ohio’s Davis-Besse pressurized water reactor. The plant operator, FirstEnergy Nuclear Operating Co., is seeking a 20-year license extension for the 35-year-old, 889-megawatt nuclear plant located on the SW shore of Lake Erie east of Toledo. On March 5, 2002, workers discovered a football-sized hole in the reactor vessel head, which was caused by corrosion. Erosion ate a large hole in the 35-year-old Davis-Besse’s 150-mm thick steel reactor head. On September 24, 1977, the reactor shut down because of a disruption in the feedwater system. On June 9, 1985, the main feedwater pumps, used to supply water to the reactor steam generators, shut down. On June 24, 1998 an F2 tornado struck the plant, damaging the switchyard, and disabling access to external power supplies. In January 2003 the plant’s intranet was infected with the slammer worm, which resulted in a five hour loss of safety monitoring at the plant. On October 22, 2008 a tritium leak was accidentally discovered during an unrelated inspection. In 2010 the plant experienced problems with the replacement head. In October 2011 after the plant was shut down for maintenance workers discovered a 30 foot long hairline crack in the concrete shield building the surrounds the containment vessel. In 2012 the reactor coolant pump seal developed a pinhole leak. A final decision on the operating license renewal is expected next September. About 1.8 million people live within an 80-km radius of the nuclear plant. The White House has declared a major disaster exists in the State of Missouri due to severe storms, straight-line winds, and flooding that occurred during the period of August 2-14, 2013. The worst of the losses and damage occurred in Barry, Camden, Cedar, Dade, Dallas, Laclede, Maries, McDonald, Miller, Osage, Ozark, Phelps, Pulaski, Shannon, Taney, Texas, Webster, and Wright counties. Additional designations may be made at a later date if warranted by the results of damage assessments, said FEMA. The State of Missouri was also declared a Major Disaster Area on July 19, 2013 due to severe storms, straight-line winds, tornadoes, and flooding that occurred during the period of May 29 to June 10, 2013 in Barton, Callaway, Cape Girardeau, Chariton, Clark, Howard, Iron, Knox, Lewis, Lincoln, Maries, Marion, Miller, Montgomery, Osage, Perry, Pike, Putnam, Ralls, Shelby, St. Charles, St. Louis, Ste. Genevieve, Stoddard, Sullivan, Texas, and Webster counties. RIM FIRE has become the 3rd largest wildfire in California history after burning at least 246,350 acres (997km², or 385mi²), including about 7 percent of Yosemite’s backcountry. The fire was reportedly 80 percent contained as of posting. Rim Fire information may change until the fire is contained. Source: Cal Fire. Fire activity is expected to intensify Friday as unburned areas within control lines are consumed on the Rim Fire. Hotter and drier weather conditions will persist through Sunday increasing the chance of spotting of embers across containment lines. The impact of climate change is more intense in the far north, where temperatures are warming faster than the global average, causing rapid thawing of the sea ice, melting the permafrost and forcing residents of remote Alaskan areas out of their villages, said a report. 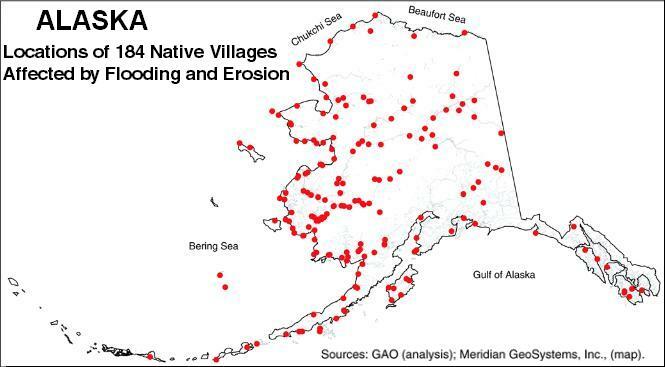 Some 184 Alaskan villages, or 86% of all native communities, are at risk because of climate change. 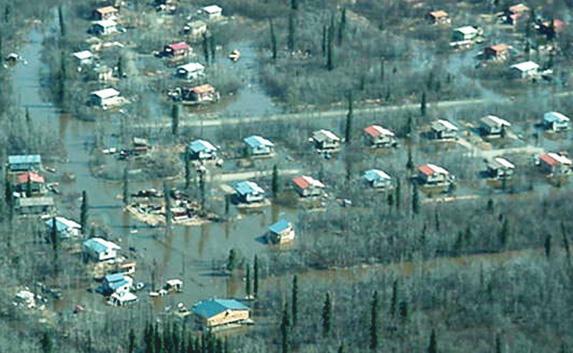 Approximately 6,600 miles of Alaska’s coastline and many of the low-lying areas along the state’s rivers are subject to severe flooding and erosion. Most of Alaska’s Native villages are located on the coast or on riverbanks. Locations of 184 Native Villages Affected by Flooding and Erosion. Source: GAO. Permafrost (permanently frozen subsoil) is found over approximately 80 percent of Alaska. It is deepest and most extensive on the Arctic Coastal Plain and decreases in depth, eventually becoming discontinuous further south. In northern Alaska, where the permafrost is virtually everywhere, most buildings are elevated to minimize the amount of heat transferred to the ground to avoid melting the permafrost. In northern barrier island communities, the permafrost literally helps hold the island together. However, rising temperatures in recent years have led to widespread thawing of the permafrost, causing serious damage. As permafrost melts, buildings and runways sink, bulk fuel tank areas are threatened, and slumping and erosion of land ensue. —GAO. Sum total of the remaining options? You can run, but you can’t go far!